This is a 12-string version of the FG720S. It has solid spruce top, laminate nato back and sides, nato neck, and rosewood fretboard, bridge and headstock overlay. It has a natural finish. It is advertised as a dreadnought, but the lower bout is larger than the standard dreadnaught size, so this is closer to a mini-jumbo. I've been playing guitar for over 40 years now and playing 12-string off and on for over 35 years. Although I played in various combos when I was in high school and college, I do mostly singer-songwriter stuff now. I purchased this from a Best Buy store for a beater guitar to have to take on picnics, vacations, etc. I paid less than $300 for it but the store gave me a discount since all they had in stock was the display model. The first positive feature of this guitar is the construction quality. It had no loose braces or glue joins on the inside. There were no sloppy glue joins either. Secondly, since this was purchased from a 'box store,' it was apparent they did not do any setup to the guitar, so this is a factory setup. The setup at the factory is excellent. The action was perfect and the frets were dressed so there were no burrs or fret wires extending over the edges of the fret board. I could not find any negative features given the quality of construction and materials used. The construction quality: It had no loose braces or glue joins on the inside. There were no sloppy glue joins either. The frets were dressed so there were no burrs or fret wires extending over the edges of the fretboard. The setup was done at the factory since this was purchased through a box store and it was perfect: It played smooth as silk even down to the 14th fret. Over the past 35 years I've owned a half dozen different 12-strings (including this one), I've played or demo'ed at least two dozen more from Taylors and Guilds to models from Alvarez, Washburn, Samick, Ibanez, Walden, and Epiphone. Playing this evoked memories of my first 12-string, a Conn F-28-12 that I owned 35 years ago, which also was closer to a mini-jumbo size masquerading as a dreadnought. This has enough bass presence to sound rich and full, without losing any of the chime-like quality for which 12-strings are known. 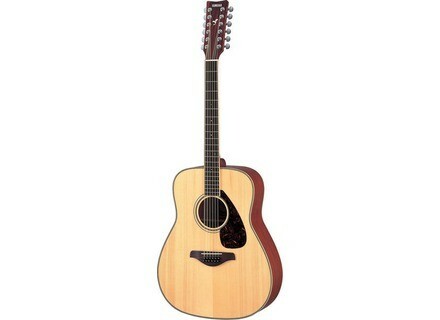 The only way I can imagine having a better 12-string guitar would be if I had $2k or more to spend on one.